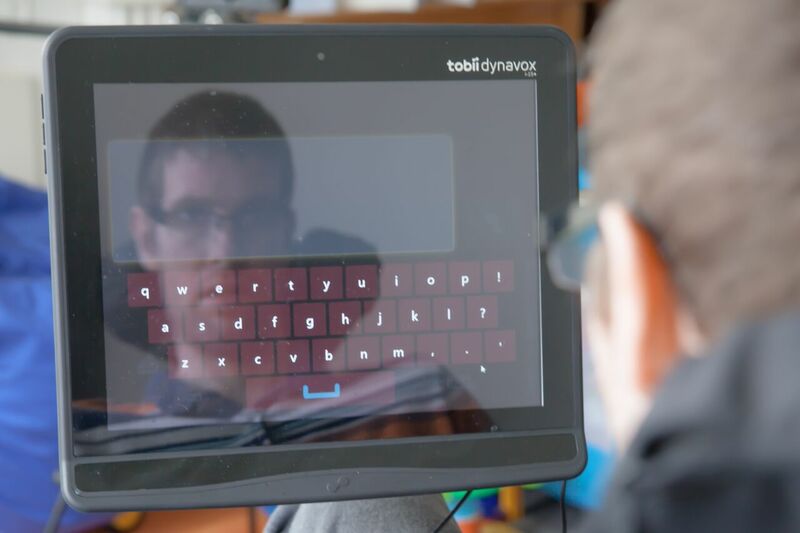 The Tobii Dynavox I-12+ and Tobii Dynavox I-15+ are speech generating devices that can be controlled through gaze interaction via an optional built-in eye tracker. 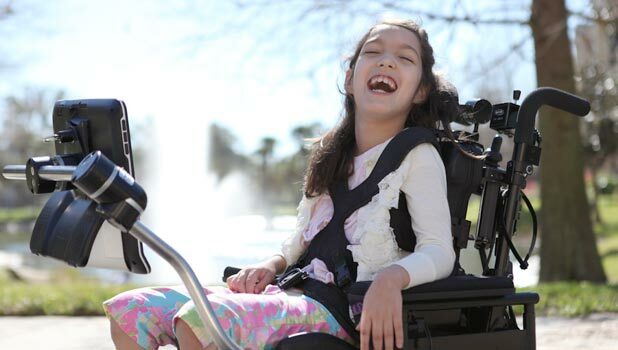 The I-12+ and I-15+ are optimised for individuals with Cerebral Palsy, Rett, MND or Stroke/Aphasia, who rely on augmentative and alternative communication to make their voices heard. TD Care covers you for accidental damage of your Tobii Dynavox device. The devices come with 3 years of TD Care. Additional years can be purchased. The I-Series+ is also available as a hire item. Please enquire with our team at office@linkassistive.com for pricing and availability. The Tobii Dynavox I-12+ and Tobii Dynavox I-15+ are speech generating devices that enable effective communication in all forms – from voice output, environmental control and computer access, to long distance communication. A rugged design, unparalleled power management, support for touch to gaze interaction and more make the I-Series ideal for everyday use. 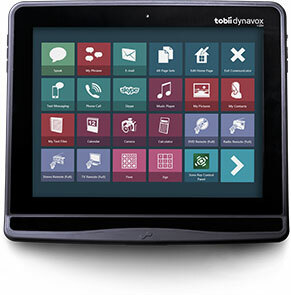 The Tobii I-Series+ are available with either Communicator 5 or the Compass 2.7 software. Snap + Core First also included. 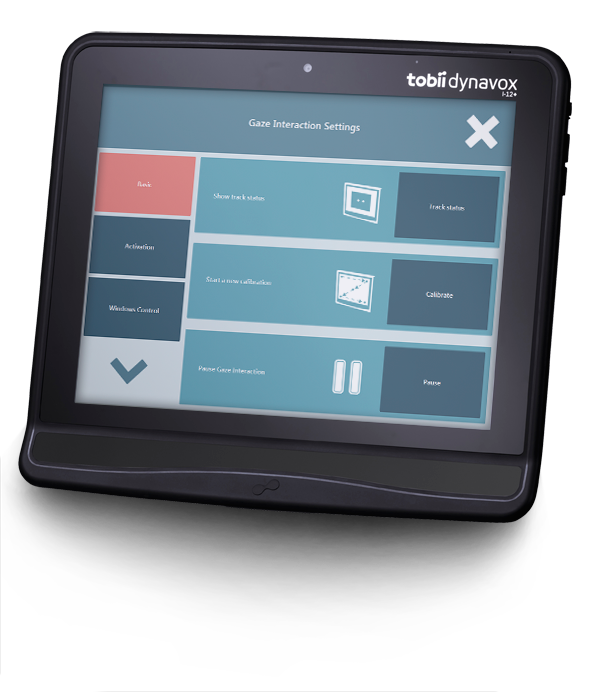 The I-Series+ consists of the Tobii Dynavox I-12+ and the Tobii Dynavox I-15+, two speech generating devices that can be controlled through gaze interaction via an optional built-in eye tracker. 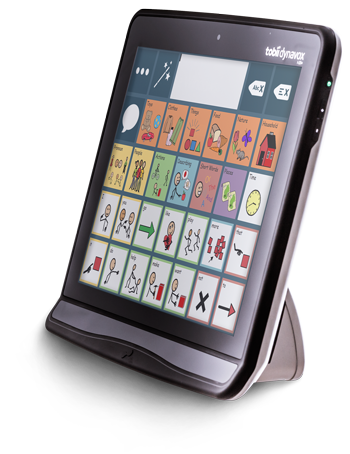 The I-Series+ is optimised for individuals with Cerebral Palsy, Rett, MND or Stroke/Aphasia, who rely on augmentative and alternative communication to make their voices heard, in order to live more independent and integrated lives. From face-to-face to long distance communication, the I-Series adapts to your lifestyle and can be used indoors, outdoors, in bed, at the dinner table – anywhere, anytime. With the Tobii I-Series, staying social has never been easier. The wide range of software and functionality lets you easily engage in daily communication through speech, as well as effortlessly connect with others via e-mail, text messaging, chat, Skype or through phone calls using the most advanced Bluetooth technology. I-Series devices also lets you take and share photos, surf the web, play games, access regular computer applications and control the environment around you. 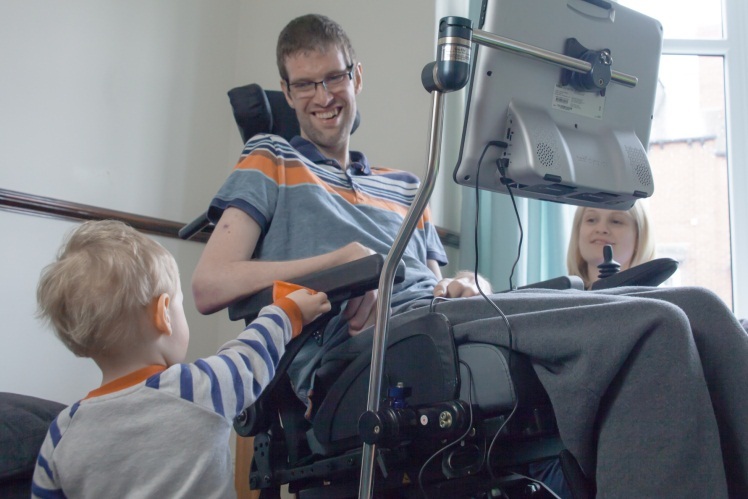 Tobii I-Series devices are designed with a purpose – to adapt to your needs and provide more communication independence than ever before, while standing up to the hardships of everyday life. Take it along with you without worrying about damage. Use it in noisy environments and still be heard. Switch users at school without losing your personal settings. I-Series devices are convenient, reliable, tough and built to be used. Tobii I-Series devices are built to withstand everyday use, regardless if the devices are carried by hand or mounted on a wheelchair. With scratch resistant Gorilla Glass™, a solid state hard drive (SSD) that withstands impacts, a clean, modern design with integrated eye tracker* as well as no cables or other components sticking out, I-Series devices are less prone to getting caught on things or breaking. Being IP43 classified means that the I-Series devices are proven to resist moisture and particles. Hot swappable batteries give you up to nine hours of non-stop communication on one charge. With power optimized settings such as the built-in auto brightness adjustment and the unique Wake on Gaze™ and Sleep on Gaze™, you can conserve battery life giving you 24 hour access to communication, without charging. Hot swappable batteries allow for endless communication as they can be charged and changed without disrupting usage. Put your I-Series device to sleep or wake it up by simply gazing at an “eye button” located outside of the screen. For example, you might want to read in bed before going to sleep. Simply turn off the device when you are done, and when you wake up, quickly follow the illuminators that guide you to the eye button and turn on the device. No blue computer screen keeping you awake at night. With a wide range of mounting options you can communicate from any location, in bed, at the dinner table, at school etc. The wedge design and auto screen rotation lets you stand the device upright for gaze interaction, without having to mount the device, or lay it down for touch interaction. While on the move, a built in handle makes carrying between locations easy. Tobii I-Series devices also come with a reversible mounting plate that supports both Rehadapt and Daessy mounting systems for use at home or school. With the Tobii I-Series, staying social has never been easier. Whether face-to-face conversations, staying in touch online or sharing personal moments with family or friends, you have total freedom of expression. Input jacks, USB ports, HDMI, Bluetooth and Ethernet inputs, allow you to connect to most networks and they also let you add switches. 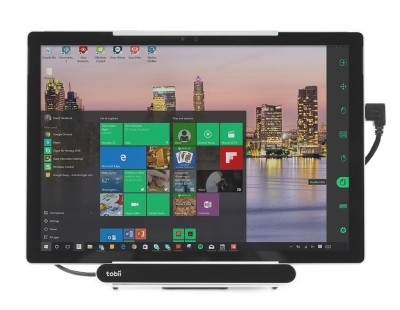 The HDMI port lets you connect to a large screen TV or smart screen at school or work, allowing you to share images and to interact and participate in class. Tobii I-Series devices have two cameras, one facing forward and one facing the user. Together, they let you document your day and communicate face to face with others online. Premade Tobii Communicator pagesets allow you to easily use Skype and Facebook, while the unique Tobii Gaze Interaction gives you full access to Windows as well as other social media applications, almost with pixel precision. I-Series devices come preprogrammed with the popular GEWA codes, which are easy to setup and use. With them you can take control of things in your home or office like doors, lights, air conditioner, telephones, TVs, DVD players, stereos, toys and more using only your eyes. You can also use environmental control to allow for easier socializing with friends and family. For instance, you can play games or just spend time together watching a movie. Make calls, using synthetic or natural speech, or send and receive text messages by yourself. Just use the built in Bluetooth to connect your I-Series device to a mobile phone of choice*. No more relying on someone to type a number for you – and then listen in on your conversation. I-Series devices come with both Tobii Communicator and the Tobii Sono Suite, which supports continual growth with your eye tracking device and lets you use any Windows 7 application you want. They are designed specifically to get you up and running quickly and put you on a growth path to improved communication and increased independence. *To see which mobile phones the Tobii I-Series supports, please see I-Series FAQ. 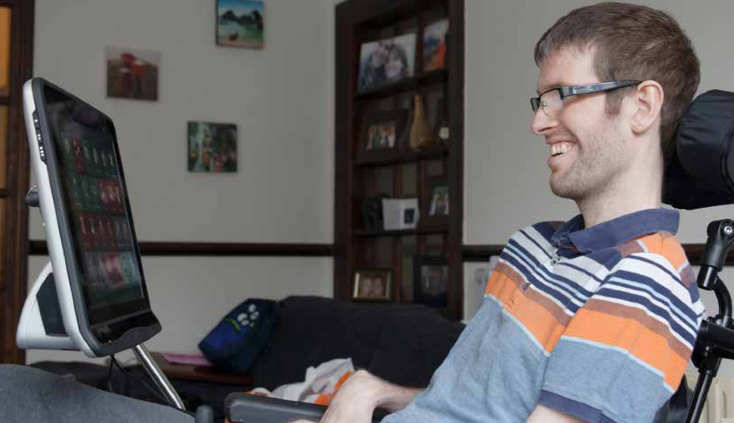 Tobii I-Series devices are designed with a purpose – to adapt to your needs and provide more communication independence than ever before, while standing up to the hardships of everyday life. I-Series devices are convenient, reliable, tough and built to be used. Communicate clearly, even in noisy environments. The two built-in speakers feature closed speaker boxes, EQ settings optimized for speech and a special speaker mesh that provide the highest quality sound without distortion, even at loud levels. I-Series devices do not contain fans, thus eliminating a potential source of noise. All of this gives you a clear voice, even at loud volumes. 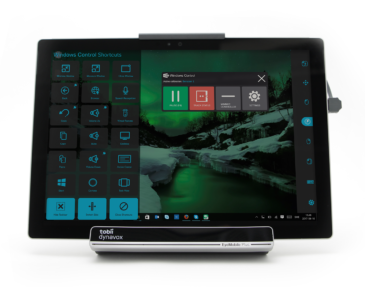 Tobii I-Series is purpose built for AAC in every detail.With a clean, modern design, integrated eye tracker and no cables or other components sticking out, I-Series devices are easy to clean, less prone to getting caught on things and do not draw unnecessary attention. A solid state hard drive (SSD) allows for fast startups and withstands impacts, while an IP43 classification means that I-Series devices are resistant to objects larger than 1mm and have passed tests where water is sprayed at a 60 degree angle for 5 minutes. Three quick access buttons on the side, two of which can be programmed to say a phrase, dial a number, navigate to a page or do whatever you like. The third one gives you quick access to the Tobii Communicator home screen. Engineered for a combination of thinness, lightness, and damage-resistance, Gorilla Glass™ is often used as the cover glass for portable electronic devices. For the first time, it can be found on an AAC device. Another useful feature is “capacitive touch”, which lets you control the device with the slightest touch and requires minimal muscle strength to operate. Don’t worry about losing pagesets, files, pictures or other data. A 32 GB SD card can be automatically backed up every week with whatever information you define and allows you to scroll back to the last three backups, so no communication time is lost. 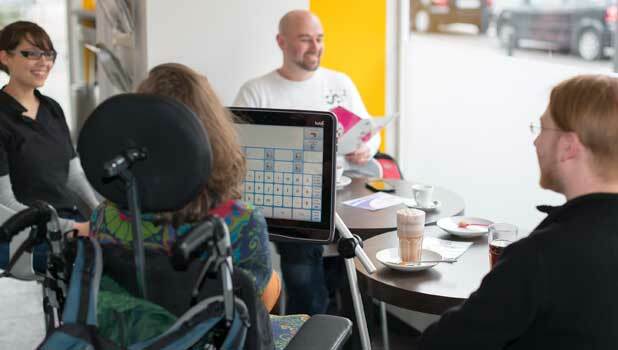 The I-Series harnesses the speed, power and accuracy of Tobii’s Gaze Interaction to provide freedom of expression and greater independence for users with communication difficulties. These new eye-tracking features, unlike anything available on the market today – AAC or otherwise – allow users to put I-Series devices to sleep or wake them up simply by gazing at “hot spots.” The ease of putting the devices to sleep during periods of inactivity significantly prolongs battery life and enhances accessibility. 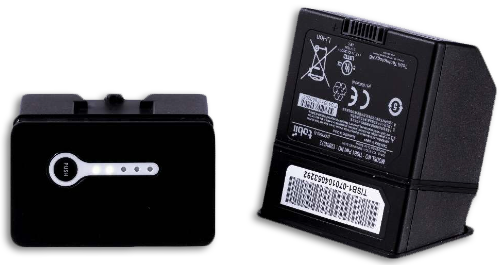 I-Series batteries last nine hours with constant use. New features, including Wake-on-Gaze, also allow users to manage power and lend to significantly longer use periods, while hot-swappable batteries also enable batteries to be changed without disrupting usage or losing data. I-Series devices are built to last, with a solid-state hard drive that facilitates fast startup and withstands impact and IP43 classification for proven resistance to moisture and dust. The I-Series also features a damage-resistant, capacitive touch screen made from Gorilla Glass™ – a first for any AAC device. Tobii Gaze Interaction with zoom and premade Tobii Communicator pagesets allows users to easily use Skype, Facebook and other social media applications with near-pixel precision. Operate infrared-enabled controls directly through Tobii I-Series devices to manage lights, air conditioning, doors, telephones, TVs, DVD players, stereos, toys and more. 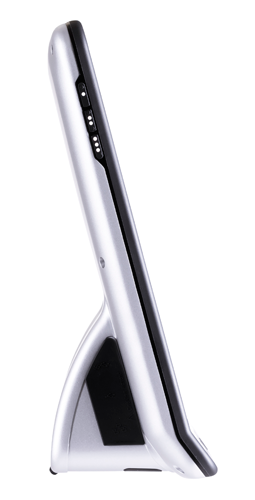 Unique wedge design and auto screen rotation let users stand devices upright without having to mount the device for Gaze Interaction or lie it down for touch interaction. Tobii I-Series devices have forward- and rear-facing cameras. Forward cameras feature an autofocus function to enable users to take crisp, clear photos. 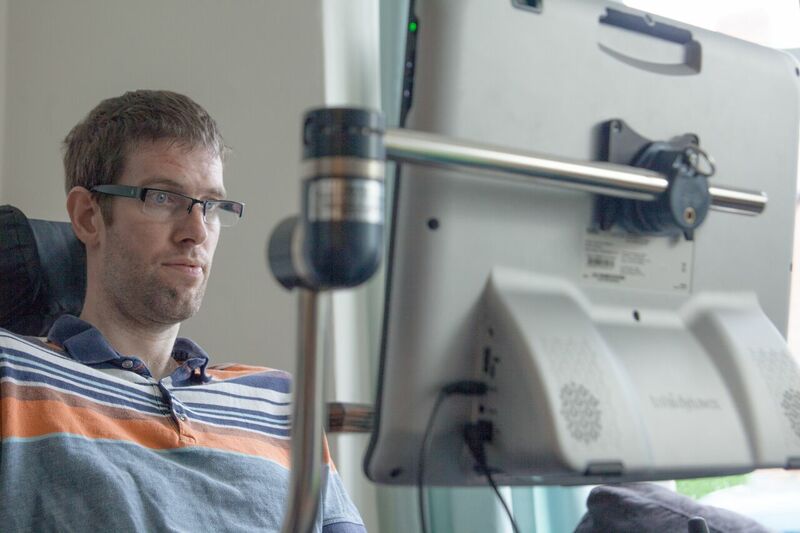 Tobii eye-tracking technology allows users to hit even the smallest targets on the screen. I-Series devices feature Gaze Interaction with optimized zoom, making selection easier than ever.